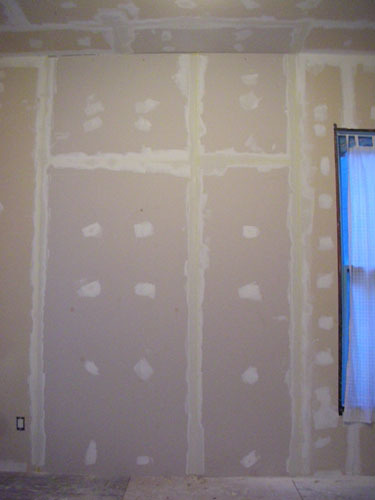 Casa Decrepit: Et Tu, Drywall? I spent much of the afternoon today mudding the front parlour. I coerced Noel into helping me out, mostly by waiting around at the bottom of the ladder and handing me tools and so forth. He also took some photos, so you get rare shots of me in action. 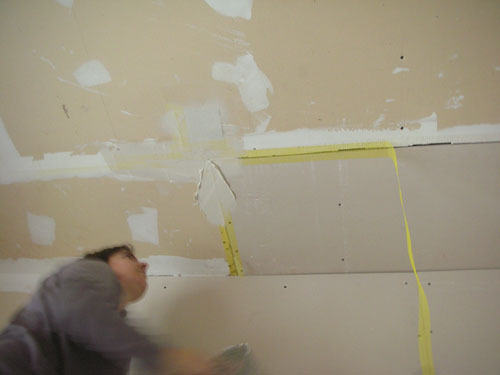 I gave some extra attention to the broom hole Contractor A (who was good at destroying parts of our house) put through our ceiling. 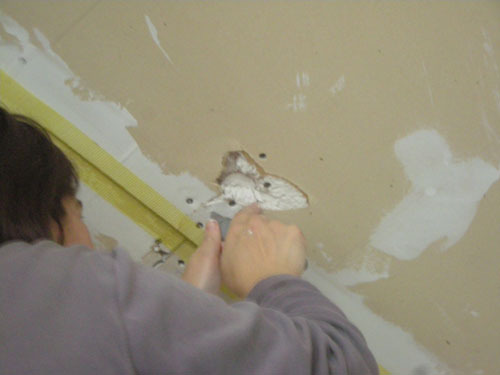 Fortunately, patching drywall is pretty straightforward and with enough mud and patience, you can basically make this kind of hole disappear. I had a bunch of larger drywall patches and scraps left over from other repairs, so Noel cut me a piece to fit and I added some tape to hold it in place. These patches work well for holes like this because they have a stiff aluminum plate that keeps everything in place. I like doing flat seams, but they are sort of a rest period. 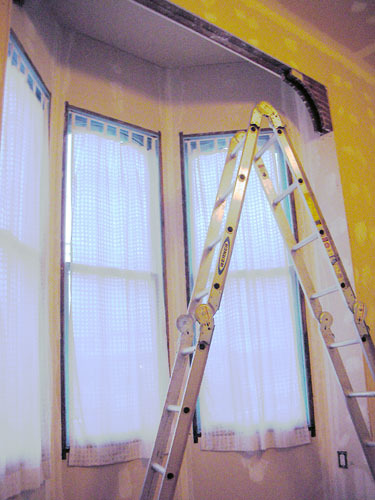 So I did five corners, then a bunch of flat stuff before going back to do more corners (I had seven corners to do today, and tomorrow I will do two more large corners and the ceiling of the bay window). I like how sometimes the position I was in made it look like I was totally posing these shots. This one especially looks completely faked, but in fact I was dealing with the combination of maintaining my balance on one of the illegal rungs of the ladder ("DO NOT STAND ON OR ABOVE THIS STEP!") and making a nice smooth stroke. I spend too much time trying to make the first coat perfect, when I should really just let it be sloppy and resign myself to a lot of sanding. Anyway, I got the four vertical seams in the bay done today, which is most of the hard work for the bay. Tomorrow the ceiling in there and the back side of the archway. I also re-did three of the four corners of the room (one was good enough to keep), and taped the verticals in the old fireplace location. 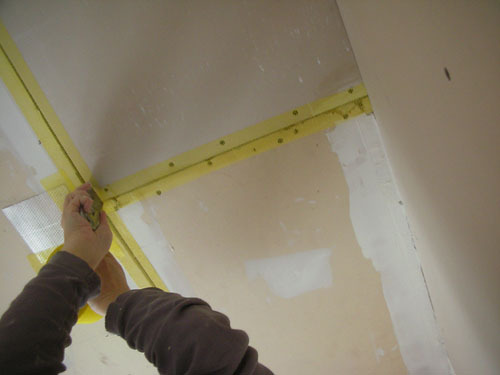 Tomorrow I will be re-taping the ceiling seam on this side of the room and the side that is behind me in this shot. I'll also be sanding all the screw holes and putting their second coat on. 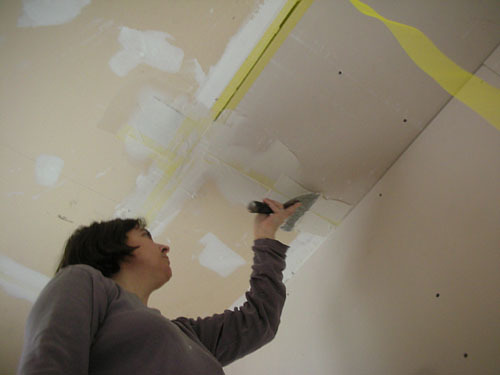 I might have enough time to do some sanding and a second coat on the ceiling, too.